Archaeologists uncover a prehistoric ceremonial structure on the Island of Minorca. In 2015, the Sa Cudia Cremada Field School began excavating the remains of a structure on the Mediterranean Balearic island of Minorca off the coast of Spain, where a unique culture, the Talaiotic, developed during the end of the Bronze Age and throughout the Iron Age period, until Romans conquered the island in 123 BC. The newly discovered structure is located at the archaeological site of Sa Cudia Cremada, in the outskirts of the city of Mahón, the island’s capital. Archaeological excavations conducted at this site have revealed a type of sanctuary known as a taula enclosure, a cyclopean building that is unique to Minorca and is not found anywhere else in the world. Moreover, materials from different periods have been recovered at the same site during the first excavation campaign, including prehistoric (Talaiotic), Punic, Roman and Medieval Islamic pottery. Sa Cudia Cremada features the typical monuments and buildings found in most of the prehistoric (Talaiotic) sites on the island. This site was a large settlement consisting of three talaiots, or truncated tower-shaped structures, two of which are located in the area with the highest density of remains. One of them is solid and has a stone staircase that leads to the top. The smallest one contained an inner chamber, although it is now collapsed. The third talaiot features a preserved inner chamber and a somewhat rectilinear façade. The settlement also has numerous structures that belonged to dwellings and funerary spaces, the latter being rock-cut tombs or hypogea. One of these tombs has seven columns carved on the rock, bestowing a monumental appearance. In addition, around the site’s limits, there are four monoliths or steles made of local sandstone, which feature carvings representing human faces. The steles form part of a modern dry-stone wall, their shapes and position on the wall forming the number 1872. These elements may have been ancient funerary steles, possibly Punic, which were reused in modern times to construct the wall where they exist today. The area with the highest concentration of remains, where two of the three talaiots are located, also includes the remains of a well-preserved building with an apse-shaped layout, which is the focus of the team’s research. The initial research hypothesis was that this building, which is located between the two talaiots, was a taula enclosure or sanctuary. The building’s layout indicated this possibility, as it has the apsidal shape that is typical of these types of sacred spaces, which date from the late Iron Age period in Minorca. Also, these buildings usually have a slightly concave façade oriented to the south with a central entrance. Sa Cudia Cremada’s building features all these characteristics and its entrance was found to be intentionally blocked with stones. Despite all this, when excavation tasks began, there was no sign of the main element characteristic to these types of buildings: the Taula monument. The taula, which means table in Catalan, is a central monument composed of a large, vertical monolith or supporting stone and a horizontal one (lintel) that rests upon it, together forming a large T-shaped monument. Because these monuments resemble large tables, long ago they were thought by folklore to be tables used by giants, who would sit around them to eat. Today, of course, we know that these monuments were erected by humans, who may have created them to represent their deities, and would have performed rituals around them. This research project began under the direction of archaeologists Montserrat Anglada, Irene Riudavets and Cristina Bravo (who also coordinates the school) in 2015, when the team began excavating the remains of the Iron Age sanctuary of Sa Cudia Cremada, a site that has been untouched until they first started digging in August. Excavations continued until the end of September and were carried out by the team members and students attending international courses organized by Sa Cudia Cremada Field School. The first excavation campaign aimed to define the structure’s layout and dimensions with a twofold purpose: to attempt to develop a clear image of its internal distribution, and to ascertain if the structure was actually a taula sanctuary. The most important finding did not wait too long to be discovered and, during the first field school session, one of the students found a large stone slab which was clearly broken and in situ. Its vertical position, shape, and location inside the building confirmed the building’s typology: this was a taula monument. During excavations, new architectural elements typical of these buildings were located, such as pilasters abutting the perimeter walls. The uppermost tumble layers removed inside the building contained a significant amount of medieval materials from the Islamic period. Some Roman pottery fragments were also recovered, which may indicate frequent visits to the site during that period. However, the most abundant materials found in the first campaign were Punic pottery fragments, mainly amphorae produced on the island of Ibiza, as well as indigenous pottery. Several lithic grinding stones and pestles were also recovered within the structure. What rituals were performed inside this religious building? Was this type of building roofed or unroofed? For how long were these building types used in Minorca? Though archaeological excavations and research tasks are slow and laborious, answers to these questions and others should shed light on the function and significance of these types of unique sanctuaries of Mediterranean prehistory. After the prolific results obtained during the first excavation campaign, the archaeological team is currently preparing for the second campaign, which will begin May 30, 2016. The project has the support of the local government of Minorca. Moreover, the site of Sa Cudia Cremada is one of 32 archaeological sites that represent the UNESCO nomination of “Talaiotic Minorca”, the main aim of which is to obtain World Heritage status in 2017. 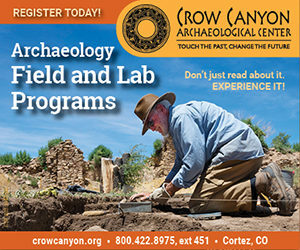 To read more about the project, or to sign up for the field school courses, visit the project’s website at http://archaeologysacudia.com/en/ , or contact the team at [email protected].